Containing lentils, mung beans and radish. The light delicate taste gives a distinctive flavour to soups, salads, dips and many other dishes. With BioSnacky seeds it is easy to grow crisp, fresh sprouts on a daily basis. Mild Aromatic Mix sprouts complement light meals at any time of the year. The light delicate taste gives a distinctive flavour to soups, dips and many other dishes. 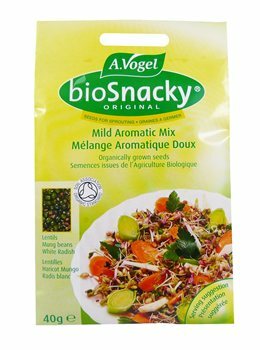 Mild Aromatic Mix sprouts are an excellent source of vital nutrients and contribute to healthy, balanced nutrition. Lentil*, Mung bean*, White Radish seeds*.